But lane splitting is already legal! Yeah, it is. I doubt many have said that more than me. But specifically legalizing splitting would let the CHP and other organizations educate riders and drivers again, (remember the lane sharing guidelines?) and would also likely remove the gray area we have around fault when a rider crashes while splitting. These are valuable goals, perhaps worth compromising for. I’ve been working with a handful of dedicated folks on AB 51 since shortly after it was introduced. We’ve met with Assemblyman Quirk, the author of AB 51, several times. It was our idea for Quirk to meet with Dr. Tom Rice, the Berkeley / SafeTREC lane splitting study guy. Early on, we told Quirk that we wanted to explicitly “legalize” splitting without limiting it, that we didn’t want to give up the flexibility we have now for a law. The first version of AB 51 was at odds with this goal, essentially codifying the CHP lane splitting guidelines. These were excellent guidelines, and they worked, according to the trends that were starting to show up in the OTS lane share surveys, but I—we—didn’t want to see these numbers (30 MPH traffic speed, 10 MPH delta) as absolute limits enshrined in law. We were very vocal about this from the beginning; we told Quirk that he should talk to Dr. Rice, and use Rice’s analysis to inform the limits in the bill. Quirk and his staff repeated this mantra over and over: Quirk is a scientist, who values data, and that we could trust he would take the data into account and amend the bill accordingly. (1) The motorcycle is not driven at a speed of more than 50 miles per hour. (2) The motorcycle is not driven more than 15 miles per hour faster than the speed of traffic moving in the same direction. (b) This section does not authorize a motorcycle to be driven in contravention of other laws relating to the safe operation of a vehicle. “Traffic speed” means the speed of surrounding traffic, and according to this, we can hypothetically split at up to 65 MPH—50 MPH traffic speed plus a delta of 15 MPH. So even though Quirk doesn’t seem to be honoring Rice’s data as he promised he would, Quirk and his staff believe that their bill, amended as per the mockup, will be good to go as-is. The group I’ve been working with is in opposition to the amended bill, and I was too. But I was uncomfortable with this position, and kept thinking and talking to riders, and Dr. Rice. I think it comes down to this. If we oppose, and successfully kill AB 51, we abandon an opportunity to get a decent lane splitting law on the books. There’s no way we’ll make any progress with a bill that says we can split at up to 65 MPH, assuming we could even get a legislator to write such a bill. Riders know that making an argument for splitting at that speed to non-riders is a dead end. So by demanding that, we’re essentially taking a hardline approach that means we’ll never get a bill that we’re happy with. AB 51, if passed as amended, would codify lane splitting in a reasonable way, and open things up for the CHP, OTS, and other organizations to educate riders and drivers again, which would be a really good thing. I think it’s worth accepting the compromise to make that happen. Stay tuned here at LaneSplittingIsLegal.com for more information on AB 51 and California lane splitting news as the bill progresses. 1) As I read more and more flaming rhetoric from car drivers who think lane splitting is illegal and/or should be banned, in the back of my mind I realize there will be benefit actually codifying lane-splitting into law. It will now be clearly legal instead of just “not illegal.” Drivers can no longer complain that motorcyclists are doing something they see as illegal. Wrong reason, but there is benefit. 2) As California goes, so do many other states. Actually having a law in the books will give other states incentive to follow-suit. And I’d sure like to lane split when visiting other states. I live in Brasil, where we can split lanes and have to respect only the street or road limit. The delta speed is up to the riders. reduce accident risks from car drivers changing lanes without signing. I agree it is better to have this bill approved and wait a while for drivers assimilate it. After a year time, fight for an amendment. Here, as in UK, we also have a designated space for motorcycles ahead of cars in the traffic light in the main avenues. There is a difference though in insurance. The only compulsory insurance for cars and motorcycles is official and costs around U$10 to U$40 per year to cover injury liability. All motorcycle riders that lane split are unsafe, period! False. It means neither can be violated independently. A rider can not exceed 50 mph and may not go faster than 15 mph above the speed of traffic. Dan, the statement you quoted (“Traffic speed” means the speed of surrounding traffic, and according to this, we can hypothetically split at up to 65 MPH—50 MPH traffic speed plus a delta of 15 MPH.) is in reference to Dr. Rice’s analysis, noted in the bullets directly above it. This difference between Rice’s analysis and the bill language is the sticking point for many folks and the reason many still oppose AB 51. You are referencing the bill language in your speed examples, not Dr. Rice’s data. I don’t see why riders should split when traffic is flowing, in other words, why is splitting needed at 50 or even 65 mph? Just to get somewhere faster with much higher risk? In my mind, it only makes sense when traffic is crawling, so the old guidelines up to 35 mph and 10 mph delta had some merit. If traffic is almost at a standstill, the likelihood of a car moving over is much more reduced. There is a reason that most other western countries don’t allow splitting (but filtering at traffic lights at the most) and there is no reason to believe that they didn’t base that on comprehensive data. Was there an attempt made to obtain other data than just one California study? Lucy, quite simply, it’s about safety, not just getting somewhere more quickly. It’s far more dangerous to his hang with the flow of traffic (and increased risk of being in someone’s blind spot) than to maintain a speed a few mph faster than the flow of traffic. Ideally, simply changing lanes periodically is sufficient, but sometimes splitting is called for. A motorcyclist never wants to maintain a static position in traffic. Lucy you have not been to Italy, Spain or France. Therefore your statement that there is no splitting in other western countries, well sounds a bit uneducated. Actually California is the only right one otherwise all States that do not allow splitting are alone in the world. As a commuter for 60+ years I have come to the following conclusions: A highway lane is constructed space wise to allow one automobile or truck vehicle within its boundaries at a time, due to obvious safety requirements. To have to move to the side of the lane to accommodate a speeding motorcycle, poses the safety issue of colliding with another car adjacent. In years past when motorcycles were in much less numbers, groups of motorcycles would travel, two abreast in a lane…..made sense to me as they are much smaller, more room in the lane and not a hazard to the bigger vehicles. Any legislation to allow motorcycles AND automobiles etc. to occupy a lane in my view would be UNENFORCEABLE, think about it. In an accident, how would one prove the excess speed, the darting in and out, the absence of turn signals and over the shoulder checking when motorcycles are moving through traffic?. Commuting in today’s traffic is very stressful knowing that motorcycles will be encountered, some with loud engines being gunned, arrogant attitudes being voiced if they are not allowed to pass at the rate of speed that they choose, and the fear that your car might be scraped by the sudden appearance of a motorcycles, before you cannot move over to accommodate them. Not to mention the accidents that these bikes cause by surprising unsuspecting motorists causing unsafe reactions with their cars. AND WHY SHOULD THERE BE LEGISLATION TO ALLOW ONE TYPE OF VEHICLE TO USE THE SAME LANE TO SPEED TO GET SOMEWHERE QUICKER? I’m hoping that there is some common sense out there that will rule in favor of the law abiding motorists, and not give in to these selfish Nuisances! @ richard – As Brian has stated so well, your take on lane splitting is myopic and misguided. We are all hoping for some common sense from the Legislature on this, which would be to take a clear unbiased look at the real data, not just some motorist’s personal perceptions. You said: “Not to mention the accidents that these bikes cause by surprising unsuspecting motorists causing unsafe reactions with their cars.” In fact, the recent study proves that this is simply not the case. Lane splitting does not cause more accidents and in fact when done safely, prevents them. I understand your frustration with SOME motorcyclists who display an arrogant attitude or rev a loud engine. I’ve experienced these things myself and find it unnecessary and immature. However I would never judge everyone by the actions of a few and remove an important safety bill because of that. A huge misconception here: Lane splitting in California is NOT LEGAL……BUT it is NOT ILLEGAL either. It is in the official capacity “Allowed”. There is a loophole in the law that makes it possible. Before I get attacked or commented on I want to read the AB51 legistation bill to make it law. Nope. Things that aren’t illegal are legal. The complete bill is posted in the article above. While lane splitting, I never check my speedometer. That takes a full second of attention off the road. Nor could I know the speed of cars around me to do head math. Legislating relative speed numbers is no good. This is not a good way to educate the public that lane splitting is reasonable practice, though motorists are in no way obligated to cede space to splitters. Many do, which is nice of them, but I when passing, which is what it is, it is my obligation to avoid causing an accident, not theirs. I can’t support the bill. I see no safety benefit. Motorists do in fact have to cede space for passing traffic. Obstructing traffic has been illegal in California for many decades. That doesn’t mean they have to move over for us, however it does mean they may not move to block us either. By codifying splitting, it makes this even more clear for motorists. – It removes the grey area which some irresponsible riders are in, where their speed differential is extreme and dangerous. – It raises awareness for motorists that the practice is completely legal. – It enables public agencies and organizations like the DMV, CHP and MSF to write and teach safe guidelines. – It sets a precedent for other states who are considering similar legislation. – It gives officers an enforceable code to cite riders and motorists. – Best of all, it removes officer discretion from the practice. As many of us have found out the hard way, officers that personally don’t approve of lane splitting can and will arbitrarily cite riders. This will prevent them from doing so and will put this in the hands of the courts, where it belongs. Filtering is one thing, but lane splitting above the flow of traffic in California? In most cases I witness that means the motorcycle is speeding. This is out of the Berkley study. It says that lane splitting “slightly reduces” crash frequency. At the same time this law appears to push the liability for incidents onto the car driver. Doesn’t seem fair or sane. AB-51 is written as if the whole lane splitting argument is based on some idea that all or most motorcycle riders are responsible riders who are primarily concerned with getting rear ended in slow or stopped traffic. Furthermore, who cares what happens in scooter-heavy Europe. I’d venture if Europe was flooded with wide glide bikes that can only lane split if they have access to both lanes. Plus Europe, South American and Asia have always had a much higher ration of bike and scooters. Do I have to also suggest that even trucks are smaller in Europe. I’d venture someone will say, ‘but the roads are narrower there too”! Small cars, small motorcycles, lower limits on typical roads. It isn’t as if all of Europe is laced with Autobahns and Interstates. Even so, with the exception of the Autobahn, Europe’s two-wheeled history is based on commuting in dense urban environments, not the wide, expansive road system we have in the US. So be honest, filtering to the front to avoid being rear ended is one thing. Passing a car in the same lane, regardless if it is one or two lane highway is dangerous behavior that puts more responsibility on a car driver. In fact car drivers will have to (and do) accommodate lane splitters when they run out of room. Happens all the time. It is not passing to be safe, it is passing for the sake of passing. Then we get back to who is responsible when a lane splitting motorcycle, regardless if all drivers were driving in a responsible way, but an unfortunate incident occurs. Who determines if the lane was wide enough or who was responsible sans video? For example, last Sunday, coming down from Truckee on I-80 in pretty tight traffic. Three riders with passengers on wide HD style motorcycles push through between lanes as a group. Safe traffic speed was variable between 25mph and 50mph. If there had not been traffic, they’d have made passes using available lanes, but traffic was stacked up. Were they lane changing for safety or just splitting because they could? I suggest the latter. This situation would seem to support lane splitting for a single motorcycle rider, but groups? Filtering is easy to understand, splitting is not. When AB-51 is re-introduced, maybe Bill Quirk will have the sense to exempt cars from being primarily responsible and let the rule of the road, that is, if you rear end or hit someone from behind, you are presumed the responsible party unless compelling evidence suggests otherwise. Furthermore how about stuffing even filtering of lanes by groups of motorcycles. Bottom line, but the onus on the motorcycle rider, to prove conditions were safe enough to split. Also, add a hefty fine for lane splitting if that delta speed takes them above the legal speed limit. Triple the normal speeding fine. Finally, let insurers adjust motorcycle rider rates dramatically if any law is enacted AND the accident rate goes up. Write into law that insurance companies can shield themselves from lane splitting. As it is any law increasing lane splitting is practically unenforceable. A motorcycle is not speeding if it is not exceeding the posted speed limit. Since the law caps splitting at 50 MPH, this eliminates the splitting in order to speed argument. What “seems fair or sane” may not have anything to do with what’s logical or safe. Fortunately, people’s perceptions or feelings about lane splitting have nothing to do with this law. AB-51 doesn’t shift liability from one party to another. Although lane splitting isn’t codified yet in California, it is currently legal, by virtue of the fact that it’s not illegal. What is illegal is obstructing traffic, road rage, opening a car door in traffic, tailgating, etc… These are the problems motorcyclists currently contend with during their daily commute. Perhaps the strongest argument for the passage of AB-51 is driver awareness. What happens in other European and Asian countries is important when gauging legislation because it helps to have other control groups to compare with in any study. Invariably, where lane splitting is allowed in other countries, there has not been any documented increase in the number of motorcycle accidents. Basically, that means it works. Whether the lane is wide enough or not is up to the motorcyclist, who as with any driver must determine whether it’s safe to pass a vehicle or not. We make those decisions every day without thinking about it, regardless of what we drive. Again, AB-51 doesn’t throw any additional responsibility on the backs of motorists. The bottom line is it’s NOT the responsibility of the motorcyclist to prove that conditions were safe in the case of an accident. As in any accident, it must be examined on a case-by-case basis and responsibility determined based on the facts. One party isn’t automatically guilty until they prove themselves innocent. As with any fine for anyone, whether it’s a motorist, cyclist, motorcyclist or pedestrian, these are set based on the seriousness of the infraction. If a motorcyclist passes in an unsafe manner, I imagine it would be no different than an unsafe passing fine for a motorist. The setting of fines is a whole different topic, and a contentious one at that, since most are excessive in California. Insurance rates will go down. Why? Because the study shows that accident rates actually go down when a rider splits lanes. It’s safer. With motorists aware of the legislation and more motorcyclists practicing lane splitting, this will only result in fewer accidents and lower rates for everyone, including automobile drivers. And to your last argument – lane splitting most certainly is enforceable, just as it is now. The passage of AB-51 doesn’t eliminate other passing laws which can and will be enforced, and in fact it will establish a new law which law enforcement can use to base an observation and citation on. As a working safety professional, I find this law to be crazy. Reguardless of how you look at it “It’s Not Safe”. I have driven the 405 for a few years and the traffic can be moving just find at 55mph and here comes a motorcycle going alot faster they that, driver’s don’t have the time to react properly. Motorcycle rider think they have the right away, all the time, they also think the cars should move out of the way. Seen a few accidents with motorcycle which wouldn’t of happened if the motorcycle wasn’t trying to lane split in the first place. This law should be remove and lane splitting should stop. As a working professional, I find your response to be crazy. I’ve been commuting on CA freeways for 25+ years and can’t help but notice that I’ve never been rear-ended but have managed to avoid other lane splitting “perils.” Sure, some motorcyclists assume others will move out of the way, or take risks they shouldn’t, but for those of us who lane split safely every day, shouldn’t we be allowed reasonable legal protections? Like Brian, I’ve also safely commuted by motorcycle in SoCal for decades and have split traffic on various freeways, including the 405 without any accidents. I’m not sure who you’re quoting when you say “It’s Not Safe” but the studies conclude otherwise. What’s crazy as a motorcyclist is placing yourself in the middle of bumper to bumper traffic between two 4000 pound vehicles operated by distracted drivers who don’t look for motorcyclists and generally don’t see us. That is crazy. Like a game of roulette, it’s only a matter of time before you get sandwiched front to back in traffic. Splitting gives the fore-aft dimension back to the rider as a means of escape. No part of this law states that motorcyclists automatically have the right of way, however it should also be stated that motorists also don’t automatically have the right of way. A shared lane is just that. One party courteously sharing a space with another. And for those who believe cars don’t split lanes, how many have taken advantage of a space in the same lane to squeeze by and make a right turn at a light. Is that codified? No. Is it legal? Yes. Lane splitting is not legal, nor in a grey area, it’s now “allowable”! If AB 51 makes lane splitting a law, how will it be enforced? Only one vehicle can occupy a lane a one time, except when merging on or off the highway or when making a right turn at a signal or stop sign. The law that needs to be written is a moral one when motorcycle riders decide to lane split, which is “do I feel lucky today”? Completely legal in your head doesn’t really mean anything according to the Motor Vehicle Code. Making up your own versions of motorcycle safety may increase your popularity and ego but nothing for the safety of your fellow riders. Best advice “you can give” to your lane-splitting public is to think about their loved ones and increase their life insurance, may God have mercy! John, before you leave ignorant remarks like that, please do some research and understand the results of several studies regarding the safety of lane splitting. Bottom line (I’ll save you the research), lane splitting INCREASES the safety of motorcyclists! California has significantly lower rates of motorcyclists being rear-ended (compared to other states that don’t allow lane splitting) and numerous studies have shown that lane splitting does not increase risks. In fact, the greatest collision risks to motorcyclists remains automobiles turning left in front of them (obviously, not on the freeway), and on the freeway — motorists crossing the double yellow line into or out of the carpool lane and striking motorcyclists. Lane Splitting is NOT the problem. If you understood this, you would understand why so many motorcyclists, like myself, feel this issue is about safety, not shortened commute times or “getting ahead” of cars. I split because it dramatically increases my odds of getting somewhere safely. John – AB51 was not “thrown out”. It was withdrawn by Quirk (D), who was one of the bill’s authors. He did so AFTER it had PASSED the State Assembly but before it came up for a vote in the Senate. He stated this was to work on some details in the bill and bring an improved version in 2016. Tabling bills in this manner is not uncommon when new legislation is being revised in process. Your inaccurate hyperbole, combined with your position on motorcycles using the HOV lane makes it clear that your real agenda is you dislike motorcycles on the road in general. Rather than dancing around false assumptions, why not just admit it? The only way motorcycles will ever stop lane splitting will be when the powers that be designate a special lane for motorcycles only! I ride a motorcycle daily and the thing I’m most afraid of is the unsafe behavior lane splitter’s have created on our roadways. If that’s the thing you’re most afraid of, then you really need to rethink your threat assessment skills while riding. Brian, you seriously need to rethink buying a car, your unsafe mind set is in danger on a motorcycle! I welcome lane splitters since the practice has been proven to be safer than the alternative. What frightens me on SoCal freeways is millions of angry and distracted drivers. Lane splitting in California has been deemed “allowable” by the CHP, downgraded from “legal’ almost a year ago! 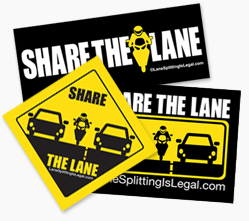 The word legal refers to “of or relating to law”, which lane splitting is not! If it is ever made a law with it’s multitude of restrictions, then this very unsafe manuever will be legal, and not before! Actually the lawmakers are now realizing that the proposed restrictions, i.e., mph while splitting, lane posturing (lanes 1 & 2 used) and traffic conditions would ultimately ban motorcycles from freeways. Some current reading material for lane-splitting enthusiasts. Also, the CHP has taken all lane-splitting references off there website, guess they’ve decided to keep this double-edged sword in it’s sheath! A concept (lane-splitting) without a precept (implementation/enforcement) are meaningless! Meaning simply that passing a law making lane splitting “legal” would change nothing on our roadways. Life would be so much easier if everyone rode a motorcycle, problem solved! In California, lane-splitting is “considered” legal, though the practice is not taught or endorsed by the California Department of Motor Vehicles nor by most motorcycle training schools. The CHP’s position — or lack of position — remains unchanged: “It’s not against the law, and it’s not authorized by law,” Harris said. Most laws effecting drivers are lobbied for by insurance companies. They like to keep payouts low. ‘Be careful what you wish for…… Everything comes with a price. Whos at fault in an accident hardly matters when you were the one on a bike at high speeds. The fact that a “Fender bender” is a typical aspect of driving for us humans the consequence to the biker are increased with speed, since it takes seconds to be within 1-2 feet away from an unsuspecting driver when beside them going faster than them. They may not be held as accountable as you hope. They may instead be held accountable for “Normal response time or normal behaviours”. Its the biker whos taking a risk by riding a bike (having no protection) and hoping for the responsibility for their risky behaviour will fall onto the other driver. Lane splitting is not legal, it is allowed! There is no law that stipulates that riding between cars is legal, read the CVC and the motorcycle handbook my fellow motorcyclist, might learn something! John—things that aren’t illegal / prohibited by existing law are by their very nature legal.